This hot, dry weather of recent weeks is not nearly as hot and dry as what a Spanish grape vine survives in. The Spanish wine industry has more acreage under vine than any other country in the world. And yet it’s not the largest producer of wine. The reason for this is that most of the country is dry and hot. Irrigation was not permitted until recently so most of the vines planted are eight feet apart – in all directions! Spanish grapes are very different. With over 400 native varieties, you wouldn’t find until recently, Sauvignon Blanc, Chardonnay, or Cabernet. Instead you’ll find white grapes such as Albariño, Verdejo, Viura, Palomino, Xarel-lo, Parallada and Macabeo. Red grapes are a bit more familiar. Widely planted are Tempranillo and Garnacha (Grenache). Tempranillo by other names can be found in bottles of Rioja, Ribera del Duero, and Toro. Garnacha is the main grape of Campo de Borja and Priorat regions, to name a few. Indigenous grapes Cariñena, Godello, Graciano, Mencia, Loureira, and Treixadura, Monastrell and Bobal have significant plantings, and produce rosé and red wines. The main grapes for sherry production are Palomino and Pedro Ximénez or PX for short. Much like the rest of Europe, you’ll find place names (Rioja, Campo de Borja, Ribera del Duero, Rias Baixas, Rueda) on the labels and more recently grape names, (Albariño, Garnacha, Tempranillo) too. In Spain, there are 69 major wine regions with either a Denominación de Origen (DO) classification or a Denominación de Origen Calificada (DOC) Classification. Denominación de Origen is a governmental regulation used to designate quality wines. About two thirds of the vineyards are classified as DO. DOC is a step above the DO level. Rioja, Spain’s flagship red, was the first region permitted this designation in 1991. Twelve years later, the only other one, Priorat received its DOC. 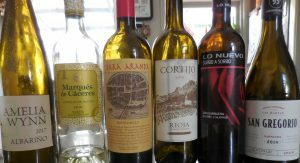 The Blind Wine Tasters gathered recently to delve into Spanish food and wine. Tasked with bringing a bottle of wine and tapas for ten, tasters sampled whites and reds, with the Machego cheese, Marconi almonds, Manzanilla olives and fresh made ceviche tapas. And with the most Spanish of dishes, paella, more reds were poured. We started with Sherry. Sherry styles ranges from very dry to very sweet and there are dozens in between. It’s a fortified wine, from cooler regions due to the nearby ocean. The Barbadillo Sanlúcar de Barrameda (place name) D.O. Manzanilla (style) is a very pale, dry wine made from the white Palomino grape. Sanlúcar is on the estuary and the cool temperatures and high humidity are perfect for developing flor, an essential yeast for sherry. It provides a blanketing cap on the fermenting wine. Around the same area but further inland is Mantilla-Morales, home of Fino Sherry. Finos are also pale and dry. The Don Benigno Fino and the Barbadillo Manzanilla are great tapas wines and a bargain to boot. Cava is the name for Spain’s sparkling wine. 95% of Spanish cavas are produced in the Penedes. The two major producers are Cordoniu and Freixnet. There are plenty of smaller producers, one of which I can highly recommend: La Granja Cava Brut is made with 70% Xarel-lo and 30% Parellada. And it’s highly aromatic and delicious. For the whites, we tasted an Albariño and Verdejo de Rueda. The Albariño outshone the Verdejo. In hindsight, I should have served the Verdejo first. It was on the drier side with more minerality. The Albariño was fragrant, juicy and a crowd favorite. Marqués de Cáceres is a producer from the Rioja and Rueda regions. Their Verdejo de Rueda took some time to open up but once it did it was fragrant with floral, minerals and citrus. The grapes, like many in this hot country are picked at night when it’s cooler and spontaneous fermentation is less likely to occur in the vineyards. The Albariño, was a Spanish grape but I kind of threw a curve ball to the blind tasters. I had tasted this wine last spring and loved it. Amelia Wynn’s 2017 Crawford Vineyard Albariño is stunning. Very fragrant, juicy and so well balanced. Red wines from Spain may have a designation on the label that tells you how much aging the wine has received. The three most common and regulated terms are Crianza, Reserva and Gran Reserva. Crianzas are aged for 2 years with at least 6 months in oak. Reservas, 3 years with at least 1 year in oak and Gran Reservas, at least 5 years of aging with 18 months on oak and a minimum of 3 years in the bottle. These wines can be exceptional bargains if you’re looking for a wine with age. The Cortijo Rioja Crianza 2016 is one of the best. A pre-fermentation cold soak boosts the wine’s aromas, color and flavors. After fermentation, half the wine spends three months in 3-year-old barrels and the other half in stainless steel tanks. This regiment produces a wine with softer tannins and better balance that highlights fruit and downplays the oak. The wine is redolent of red fruits and crushed herbs with smooth tannins and a wonderful juiciness. Also from the Tempranillo grape, Tierra Aranda from the Ribera del Duero. Harvested by hand from a rocky hillside, it’s fermented in concrete and goes through malolactic fermentation. But it’ll take a few years for this monster with hints of cherry peeking through the tannins to calm down. The fragrant Lo Nuevo Garnacha Sorbo a Sorbo 2014 from Calatayud had flavors of raspberries and minerals. Sorbo a Sorbo translates to Sip Sip which is good advice. The finish was a bit tannic but was tamed by the paella. The hands down favorite red of the afternoon was the San Gregorio Calatayud Garnacha. San Gregario was established in 1965 in the DO of Calatayud. Garnacha is the main grape of Calatayud with many plantings over 50 years old. Those old vines get to put “Old Vines” on their labels. Many wines are head pruned and not irrigated. This recipe for low production results in intensely flavored wines. I’ve enjoyed this session on Spanish wines. It made me forget about the heat for a bit. Salud!